A film by Vanessa Alexander. Magik and Rose was shot entirely on the South Island of New Zealand's West Coast. Remote, rural and eye-catchingly beautiful, the location gives the film some of its unique look and flavour. The shoot provided some real challenges. Most notably, the last 15 minutes of the film which took place at the Hokitika Wildfoods Festival and Barn Dance, which attract 15,000 people annually. With no budget to stage a mock version we had to do it live surrounded by nearly 15,000 foodies. In the words of Larry Parr, You can't buy extras like that. The festival was literally crawling with people. The main problem was stopping people looking at the camera, or asking Oliver Driver if he was the guy from Shortland Street, Vanessa says. I don't think you can call what I did that day directing - it was more like crowd control. From there it was onto the barn dance - with 5,000 coasters swilling Monteith's beer. We were on the dance floor trying to make a human wall behind the DOP to stop the camera getting bumped. It's a miracle it worked really. But it did, says Vanessa. The film is a very "kiwi" film, says Larry. It's got whitebaiting, multiple cows and an intimate small town feels about it. 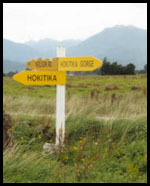 Hokitika was the perfect place to be, he says. It was a blessed shoot from the start. Vanessa soon realised everyone in Hokitika knew everyone else. When we were shooting exteriors, a helicopter kept flying overhead and ruining the shot. Turns out he was a friend of a friend of a guy drinking in the pub we were staying at. They called him - and just like that it stopped flying over. A host of locals supported the crew as extra cast, extra hands and extra advice, says Vanessa. I truly believe the incredible heart and soul of the West Coast people were an essential part of making Magik and Rose. This web site was created by Coedit Limited, United Kingdom.